Z11 is used for the mining of Equihash coins. 1. Every hash board on Z11 has a control board chain connector that is to be attached to the control board. 2. 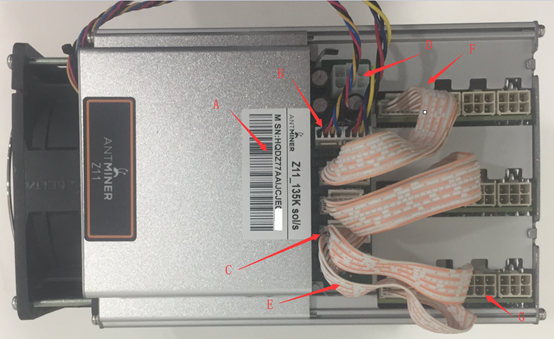 The control board on Z11 has one 6-pin PSU connector that is to be attached to a 12 V power output. 3. Ensure the Ethernet crystal head connector is plugged. 4. Check that the cables and connectors are not loose. 5. Check that the fan connectors are not loose. 6. Check that power connectors to hash boards and control boards are plugged securely in the correct direction. Click the “Miner Configuration” tab and then “General Settings” to set up the mining pools. Key in the mining pool URL and miner name (under Worker). There is no need to change the Password. The configuration is now complete. It will take about 5 to 30 minutes to get the mining started.